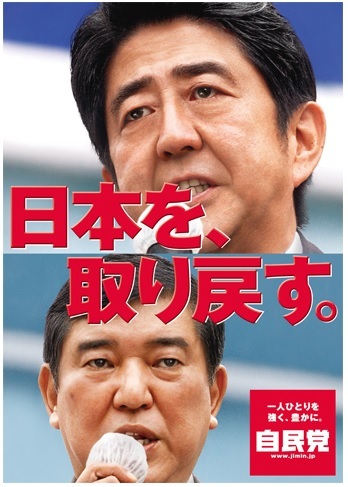 In the run up to the December 16 election, Abe Shinzo and the Liberal Democratic Party were coy about the campaign slogan on their official poster. "Nihon o, torimodosu" -- "Japan, We'll Take It Back!" "Take Japan back?" wags asked, arching an eyebrow. "From where? To where?" One would think that Abe & Company would leave the questions hanging, with no one admitting the darker reading. In the last general election, the LDP held aloft the slogan, "Japan, We'll Take It Back!" This does not simply mean taking Japan back from the administration of the Democratic Party of Japan. If I dare say so, it is the fight to return the country called Japan to the hands of the citizens of Japan from out of the grip of postwar history. How much does Abe Shinzo despise post-1945 Japan, that is to say Japan as it is? So much that he seems to not even admit that the country called "Japan" is the actual Japan. He has to qualify, using the locution Nippon to iu kuni -- "the country called Japan" -- because calling Japan "Japan" would be a...travesty? Is there an English translation of his Bungei Shunju article? If there is, I'd like to read it.